Although I’ve been living in Boston since 1994, this city is not my first love when it comes to pro sports devotion. I grew up in northwest Indiana, a short drive away from Chicago. The Chicago Bears (football), Cubs (baseball), and Bulls (basketball) have been and always will remain my favorite teams. Nevertheless, the past two decades have been a remarkable period for Boston’s professional sports teams. The once-cursed Red Sox have won four World Series baseball titles, most recently last fall. The Celtics (basketball) and Bruins (hockey) have each won their league titles during this stretch. 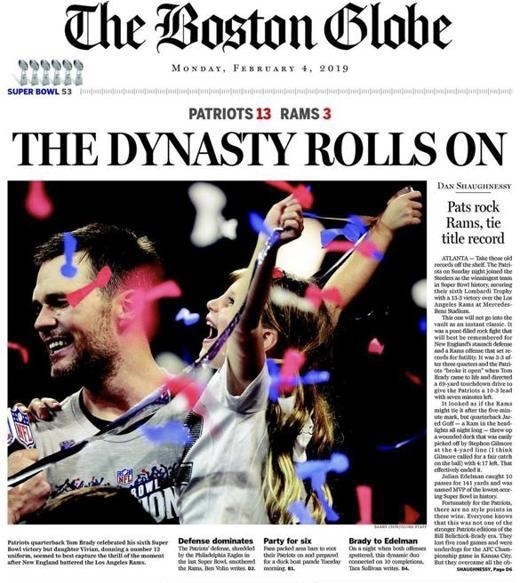 And the most successful franchise of all has been the New England Patriots of the National Football League, who on Sunday won their sixth Super Bowl championship during the current century. The Pats faced a lot of challenges this season, and even fervent fans wondered if they could mount a serious threat in the playoffs. But they pulled it together at just the right time and prevailed over three playoff opponents, including Sunday night’s prey, the Los Angeles Rams. Watching the local post-game television coverage of the Pats win was an interesting experience. It was festive, like dropping in on a bunch of parties celebrating the win — whether it was the players and coaches talking about the game and how it felt to win, or the sports analysts breaking down the individual and team performances, or the fans sharing their total exuberance over this latest, very hard-won championship. 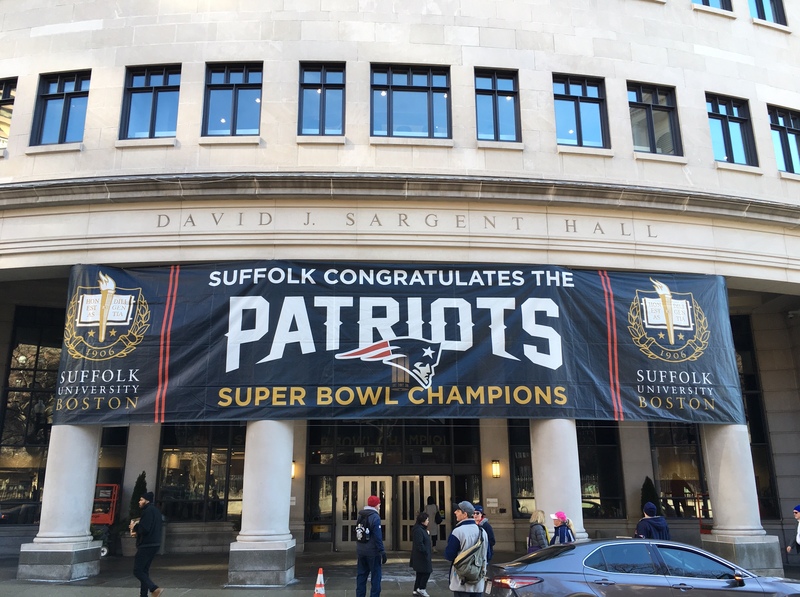 Today, the city will host a championship parade for the Pats, and so the celebration will continue. The “rolling rally,” as it is called, will pass by the building in which I work and teach(see photo above). The expected crowd size is such that university administrators canceled classes that overlap with the parade and its aftermath, figuring (correctly, I believe) that it may be nearly impossible for students, faculty, and staff to get to classes and meetings amid thousands of fans lined up on the sidewalks that connect our downtown campus buildings. All of this sporting success has had a salutary effect on the city’s self-image. Boston has long been a town with a chip on its shoulder and an inferiority complex. Mounting numbers of bad seasons mixed with some heartbreaking near misses for its beloved pro sports teams contributed to that dynamic — especially when they involved losses to teams from hated New York City. During the 21st century, however, the numbers alone establish Boston as the nation’s most winning sports town. We can and should debate whether so much civic pride should be invested in professional sports franchises. In the case of Boston, sports should not alone define the culture of a city that also can be rightly proud of its importance in American history and its many contributions to the arts, education, high technology, medicine, and the sciences. And frankly, some of that diehard fandom here can get loud and obnoxious — especially when stoked by too many beers. That said, given a choice between bad teams and losing seasons vs. winning teams and championships, I’ll take the latter, thank you. Of course, there’s no guarantee that the wins will continue, but for now it’s great fun to be a sports fan here.